Recently, my students told me about an area called “The Enchanted Forest” in Pasadena. (The locals actually call it “The Haunted Forest”). They had never been there but they had heard stories about how haunted it is. I have lived in the Pasadena/Altadena area for almost a year now and I had never heard of any local haunted places aside from Suicide Bridge. So being a curious knowledge seeking Libra, I decided to look into “The Enchanted Forest.” First step, Google. I found a few blogs that mentioned that “The Enchanted Forest” (aka Haunted Forest) is actually “The Cobb Estate” in Altadena. You simply take Lake Ave North until the street ends at the gates of the estate. 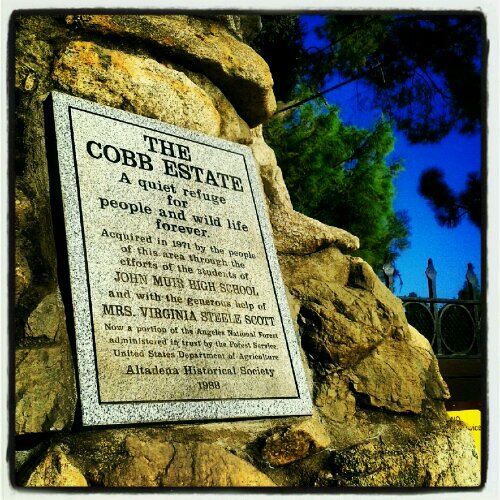 There were a few accounts and some YouTube videos about the Cobb Estate but I didn’t bother to read or watch them. I pass this area on my way home from work so I decided I would just check it out for myself and I didn’t want my own feelings or personal experiences to be corrupted by the stories of others. So I followed Lake until it ended and I noticed the iron gates on the right. I parked my car and proceeded to walk toward the gates. To my left, I heard this loud noise in the bushes. My heart started to pound as I slowly approached the bush. I inched forward and almost screamed when a doe (aka deer) jumped out of the bush and ran up the hill toward the estate. I couldn’t help but laugh at how silly I was being. I made my way to the gates, took a few pictures with my phone, and checked myself in on Facebook (just in case I went missing and my friends & family needed to know my last location). I’m guessing the driveway was once majestic but now it is worn and weathered. There was a smell of sawdust and a scent reminiscent of wood burning in a fireplace. The grass, brush and trees looked dead. As I was taking in the scenery, I noticed the locals power hiking their way past me. There was a weather-beaten sign showing the different trails that would take you up parts of Mt. Lowe. It kind of reminded me of parts of Eaton Canyon but without the crowds of people. This was a place where people come after work to hike. Yeah, the iron gates, random staircases that led nowhere, the worn down drive and signs and the dead foliage do give it an eerie sense of foreboding but if I hadn’t known about the “haunted” claim, I would just think this is a really cool place. It reminded me of the Nevada ghost towns I used to explore with my friends. With my stomach growling and my throat begging for water in the unseasonably hot weather, I decided it was time to stop exploring and head home. Now that I have fed myself and quenched my thirst, I thought it would be a good time to figure out the real story behind the Cobb Estate in Altadena. According to the Altadena Historical Society, the land was purchased by retired lumber magnate Charles H. Cobb in 1916. After a few years, Cobb and his wife, Carrie, decided to make this their permanent home and built a house there in 1918. Carrie passed away in 1934 and Cobb was able to enjoy his lavish estate until his death in 1939. As a Freemason, Cobb designated his property be left to the Scottish Right Temple. After a few years, the Masons sold the property and it became a retreat for the Sisters of Saint Joseph. In 1956, the Marx Brothers purchased the land as an investment, they had no plans of actually living there. So while the comedic family tried to find projects for developing the land, the area became a hangout for teens and “misfits” who vandalized the area and were often arrested for their misdemeanors. The once grand and luxurious mansion fell into disarray and was removed in 1959–only the foundation, a few stairways and a wall remain. The Marx Brothers tried to turn the land into a cemetery but met opposition from the residents. So in hopes of unloading the land for a housing development, the property went up for auction in 1971. Now as I was reading this tale, it sounded like one of triumph and victory, not really the makings of a tale of horror and suspense that Hitchcock would drool over. So I need to dig deeper and do a little more research. There has to be a reason why this area is called “The Haunted Forest.” In the mean time, you can see the pictures I took today and a video I found of a walk-through of the Cobb Estate. Very cool video tour. Thanks for sharing! I have seen A Ghost, This Is A true Story, Me And 2 Friends in the night time went to the enchanted forest, after hearing about ghost stories, well we were never really expecting to see what we did. We first started walking passed those weird round buildings on the left, we noticed a group of what appeared to be white hooded people behind a bush, we made jokes about we look white were safe yet gathered our strength due to hearing stories of devil worshipers, exc. when approaching the other side of the bushes the hooded men vanished like were not there yet a shadow jumped out of the bushes and ran down a slope faster then you would believe i clearly saw his arms and legs in motion and heard the shrubs moving. Thanks for sharing your experience, Steve. I have only been there during the daytime and I have just seen a lot of animals and hikers there. But the last time I was there, I did get a sense that Mr. Cobb is upset with what happened to his “sanctuary.” And I know the area that you are talking about. I went back there on my 1 year anniversary of trying something new every day. Again, I went in the daytime and I did feel some negative energy–the stuff that causes goosebumps or gives you the chills–up in that area so I just stayed away. I think it would be interesting to find out if anyone else has seen hooded figures in the area–Did they look like the KKK? There were several deer, rabbits, and the usual–squirrels, birds. Is it even worth going 2 because my sis n’law and I wanna check the place out! I didn’t find it scary but I have only been there during the day. Devil’s Gate Dam has more of a scary vibe to it.